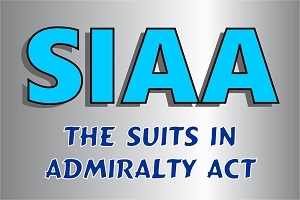 The Suits in Admiralty Act (SIAA), enacted in 1920, first permitted injured individuals to sue the government when a government-owned ship was involved in the incident that caused their injuries. Congress expanded the SIAA in 1960 to include all maritime claims against the United States. Although the government normally enjoys sovereign immunity against lawsuits, this protection is waived for suits filed under the SIAA. Therefore, the plaintiff has the same rights when suing the government that he would have against a private party, and the government has the same limitations of liability as private ship owners. No vessel arrest or jury trial is permitted under the SIAA. A two-year statute of limitations applies to these lawsuits, and the suit cannot be filed until all required administrative remedies have been exhausted. Even though the statute of limitations is two years, the lawsuit must be initiated within 18 months of the accident. This is necessary in order to allow for a six-month denial period before the statute of limitations ends. Filing an administrative claim won’t toll the two year statute of limitations, so waiting longer than 18 months to file may result in a barred claim. Lawsuits against the government are extremely complex, due to the numerous laws involved and procedural rules that must be followed. Determining if admiralty jurisdiction exists regarding a particular claim can be complicated and challenging. Claims filed under the SIAA are very different from those filed under the Jones Act, the Longshore and Harbor Workers’ Compensation Act, and other federal laws. If you’ve been injured, you need the assistance of an experienced maritime attorney when you pursue your claim. To learn more about what the law offices of Steve M. Lee, P.C., can do for you, visit us on Facebook. Should I Settle My Maritime Claim?